Steve Fossett and his crew aboard the 125ft catamaran Cheyenne yesterday recorded their best day yet. They sailed an amazing 623 miles which puts them 2,042 miles ahead of the previous record set by Orange I at this stage of the challenge. The staggering speeds over the last few days are a result of the consistent 25-30kt wind coming from around 300 degrees. At 0510 GMT this morning reports from the boat show they were 348 nm south-east of the Bounty Islands (NZ), 768 nm south-east of Wellington, NZ (53°25.240 S – 179°16.849 W and still going strong. Further down the track in the Atlantic at a position of 19°01 S – 31°32 W, Olivier de Kersauson and crew aboard the 110ft trimaran Geronimo have finally cleared themselves of the Doldrums and are now starting to revs things up a bit. In the last 24 hours they recorded 521 miles, averaging 21.72 kts and after 11 days at sea, they are still about 190nm behind Orange I’s record at this stage of the challenge. 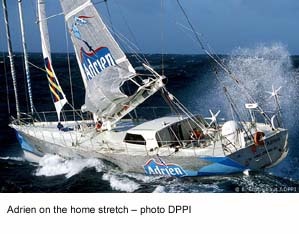 Jean Luc van den Heede should cross the Ushant finish line tomorrow morning after 122 days at sea. Sailing the 85ft monohull Adrien, van den Heede is on the final stretch home, just 390 miles to go, and is now 29 days ahead of the current westabout global record set by Philippe Monnet in 2000. Although van den Heede plans to finish in the morning, the expected time of arrival in Les Sables d’Olonne is Thursday at 1700. Polish sailor Roman Paszke and his nine-man crew aboard the VO60 Bank BPH who are currently attempting to set a fully-crewed, non-stop, monohull, round the world record, have now completed their 19th day at sea. News from the boat this morning shows in the last 24 hours they covered 246nm at an average speed of 10kts and are at a position of 22°49.684S	024°54.798W in a moderate south-easterly.